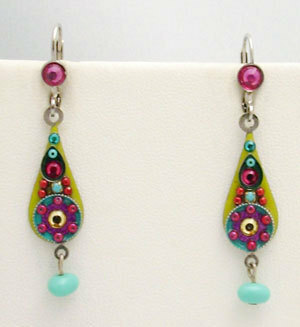 Signed ADAYA Maya Rayten Micro Mosaic Earrings Click for Larger Image These made in Israel ADAYA gorgeous earrings feature a beautiful detailed color combination of crystals, glass beads, decorative hypoallergenic metals, and hand painted enamel. 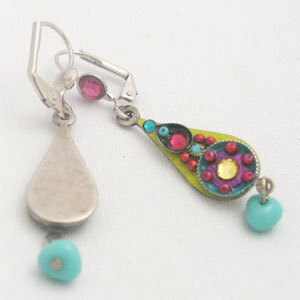 These earrings measure 2" or 5 cm long from piercing. The creative process of ADAYA's pieces is supervised by high standards of quality control and ensure excellence. The designer Maya Rayten is influenced by various cultural motives, which in harmony and with the range of materials create the uniqueness of the styles. Her jewelry collections are launched at the main leading jewelry exhibitions worldwide, as they became part of the hottest international fashion trends. To see more of this collection visit my store. Comes in a gift box and combined shipping is available up to 500 grams at no additional cost. If you have any questions, please contact me for speedy replies. Payment and shipping arrangements must be made within 3 days of auction end date, and all transactions complete within 7 days unless arranged otherwise, or item will be relisted. Return Policy - Exchange within 7 days of purchase. Click here to visit my new purpleshoshana gifts ebay store For gorgeous furs visit purpleshoshana furs ebay store Click here to view designer sunglasses and Italian leather handbags We accept Paypal Shipping policy: Item shipped within 48hrs of payment receipt. We ship internationally.